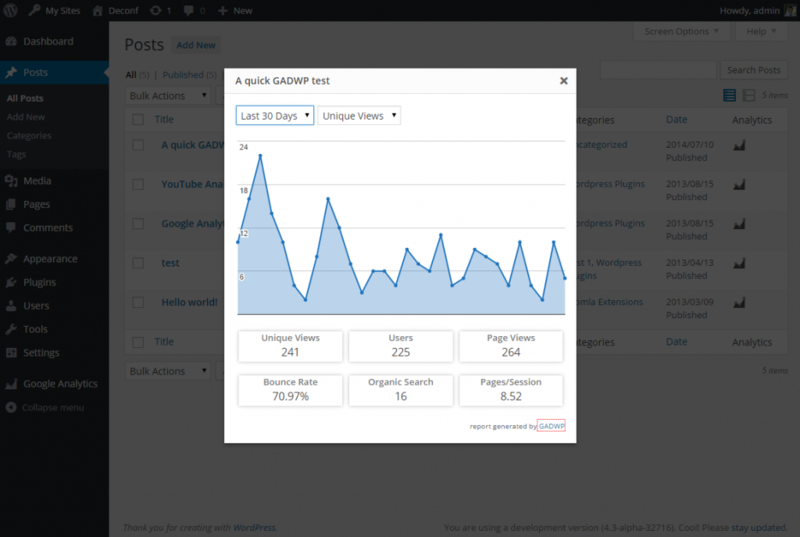 Google Analytics Dashboard for WP 4.8 will be released at the end of this week. Since there were no release notes for the previous version, in this post we’ll cover the new features available in v4.7, the re-designed frontend component of v4.8 and a few other enhancements. In Google Analytics Dashboard for WP 4.7 we’ve introduced a new set of reports, which are available under All Posts and All Pages screens. These reports are presented in a modal dialog, giving you insights about how your pages and posts are performing. They are very similar to the analytics reports available in your WordPress Dashboard screen, displaying charts about: unique views, users, pageviews, bounce rates, organic searches, acquisition channels, locations, referrers, and other traffic details. If you haven’t seen them yet, make sure you have this feature switched on from Google Analytics -> Backend Settings -> enable reports on Posts List and Pages List. To check out the reports for a specific post or page, go to Posts -> All Posts or Pages -> All Pages and click the corresponding icon in the Analytics column. Reports for every web page on Frontend! In Google Analytics Dashboard for WP 4.8 a new set of reports, similar to the above ones, are available on website’s frontend. The Google Analytics Reports link, which could be found at the end of your pages and posts, is now replaced by a link called Analytics. This item can be found in your toolbar, at the top of the screen. While browsing your website, click the Analytics link from the toolbar to view the analytics reports for the current web page. A modal dialog with a new set of reports will be displayed. You can switch between reports and date ranges using the drop-down lists available at the top of the dialog window. more complex analytics reports are now available, providing key insights about your web pages. 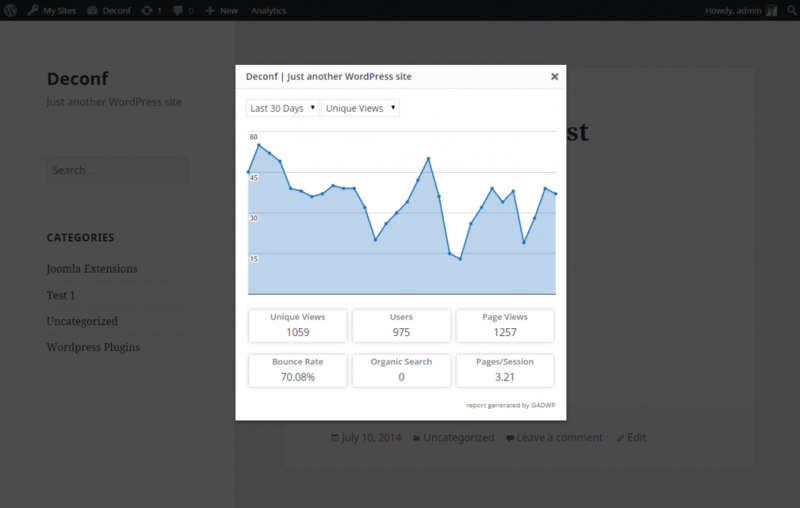 the new analytics reports are available for every web page of your website: pages, posts, front page, archive pages and even pages dynamically generated by third-party plugins. because the new link is located in your toolbar it’s less intrusive and it won’t break your theme design. some UI tweaks for the ON/OFF switches and settings layout. support for web pages with non-ASCII characters in URLs.